Part 1 The health benefits of phytochemicals: Nutritional phenolics and cardiovascular disease; Phytochemicals and cancer: An overview; Food-borne glucosinolates and cancer; Phytoestrogens and health; Phytoestrogens and bone health; Carotenoids in food: bioavailability and functional benefits; The functional benefits of flavonoids: The case of tea; Phytochemicals and gastrointestinal health. Part 2 Developing phytochemical functional products: Assessing the intake of phytoestrogens: Isoflavones; Testing the safety of phytochemicals; Investigating the health benefits of phytochemicals: The use of clinical trials; The genetic enhancement of phytochemicals: The case of carotenoids; Developing phytochemical products: A case study; The impact of food processing on phytochemicals: The case of antioxidants; Optimising the use of phenolic compounds in foods; Phytochemical products: Rice bran. Plant foods are rich in micronutrients, but they also contain an immense variety of biologically-active, non-nutritive compounds that contribute to colour, flavour and other characteristics. These phytochemicals have been increasingly linked to reducing the risk of chronic diseases such as cancer, osteoporosis and coronary heart disease. 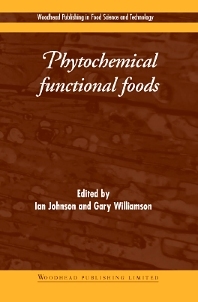 Edited by two leading experts in the field, and with a distinguished international team of contributors, Phytochemical functional foods assesses the evidence for their health benefits and reviews the key issues involved in successful product development. Part one reviews research on the health benefits of phytochemicals, including chapters on cardiovascular disease, cancer, bone and gastrointestinal health, as well as the functional benefits of particular groups of phytochemicals such as phytoestogens, carotenoids and flavonoids. Part two considers the important safety and quality issues in developing phytochemical products. There are chapters on establishing appropriate intake levels, testing the safety of phytochemicals and establishing health claims through clinical trials. Part two also covers such issues as extracting and enhancing phytochemical compounds for use in food products. Phytochemical functional foods will establish itself as a standard reference on one of the most important sectors in the functional foods market. Professor Gary Richardson is Head of Metabolic and Genetic Regulation at the Nestle Research Centre in Switzerland. Both have written widely on the subject of phytochemicals.